It's Nice to Have a Girl Around the House. This just sort of came to me. 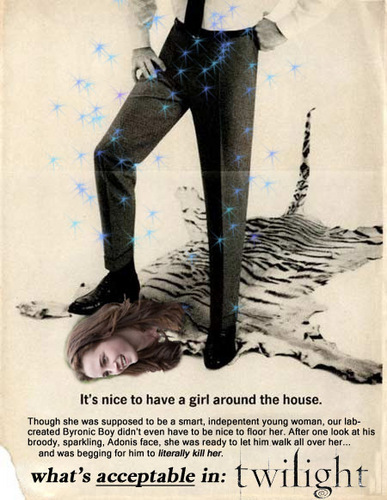 Think of it as a mash-up of Twilight and 70's advertising.. Wallpaper and background images in the Critical Analysis of Twilight club tagged: twilight funny anti critical analysis edward cullen vampire sexism feminism. "Though she was a tiger lady, our hero didn't have to fire a shot to floor her. After one look at his Mr. Leggs slacks, she was ready to have him walk all over her. That noble styling sure soothes the savage beast. If you'd like your own doll-to-doll carpeting, hunt up a pair of these he-man Mr. Leggs slacks." I've always been fascinated in examining sexism in advertising. This is one of my favorites, in a scary, dark humor way.